In 1986, Soviet Refusenik Natan Sharansky gained his freedom through the final Cold War exchange conducted on Berlin’s Glienicke Bridge. Brooklyn attorney James B. Donovan found himself negotiating the first. At trial, he had represented convicted Soviet spy Col. Vilyam Fisher, a.k.a. Rudolf Abel, a British born KGB agent, who had narrowly escaped Stalin’s purges during his time with the NKVD. Presumably, the Russians will want him back, just as America wants Francis Gary Powers safely returned. 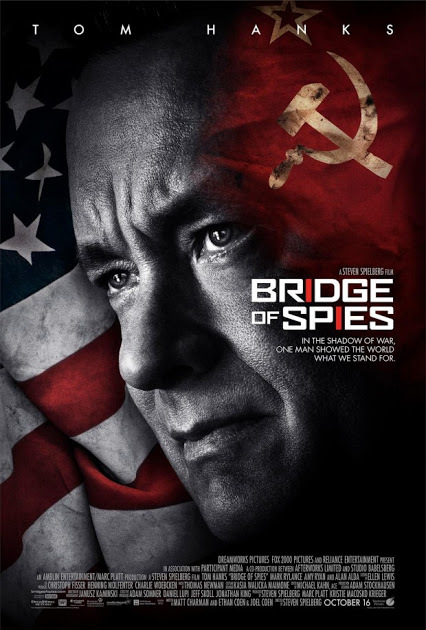 To negotiate the deal in his unofficial capacity, Donovan navigates the murky political waters of Berlin during the final days of the construction of the Wall in Steven Spielberg’s Bridge of Spies (trailer here), which screens as a Main Slate selection of the 53rd New York Film Festival. Donovan the kind of stickler lawyer you do not want to be haggling with. Since he was also a junior member of the Nuremberg prosecution team, the Brooklyn Bar helpfully nominates him as Abel’s attorney. Although not thrilled, Donovan does his duty more diligently than anyone anticipates. Nevertheless, Abel is convicted, but conveniently not sentenced to death. Sometime after U-2 pilot Powers’ capture and show trial, Donovan receives a strange overture from East Germany. With the CIA’s blessing but no official portfolio, Donovan tries to negotiate an Abel-for-Powers deal, but it is complicated by the arrest of American economics student Frederic Pryor on transparently bogus espionage charges. Suddenly the dodgy Wolfgang Vogel representing the GDR wants to swap Pryor for Abel, while the Berlin KGB station chief is willing to deal Powers for Abel. While there is a bit of le Carré equivalency baked into screenwriters Matt Charman and Joel & Ethan Cohen’s depiction of the respective intelligence agencies, there is no denying the oppressive bleakness of East Berlin. Production designer Adam Stockhausen’s team vividly recreates the rubble strewn streets, bombed out blocks, and ominously imposing Berlin Wall. To his credit, Spielberg also shows exactly what happened to those who tried to scale it. Of course, Donovan is exactly the sort of exceptional everyman that has become Hanks’ specialty. While he brings an instant credibility and a certain comfort level to the character, he never delivers any surprises—only sniffles as Donovan endures an awful cold. On the other hand, Mark Rylance is weirdly mesmerizing as the off-center Abel, precisely because of his restraint. It is like his face is a Rorschach test, which you cannot stop staring at. For traditional villainy, Sebastian Koch chews plenty of scenery as Vogel, but he gets somewhat shortchanged on screen time. However, nobody is as embarrassingly unnecessary as Amy Ryan, playing an underwritten Mary Donovan, whose sole function in the film is to hassle her husband to bring back Harrods marmalade from his supposed fishing trip to Scotland. Thanks to Stockhausen and cinematographer Janusz Kaminski, Bridge looks terrific, but it is relentlessly over-scored by Thomas Newman. Instead of evoking a noir atmosphere, he indulges in symphonic sentimentality. Granted, it is a Spielberg movie, but it sounds too much like a Spielberg movie. Just imagine what could have been if someone like the great Tomasz Stanko (a Krzysztof Komeda protégé) had composed its themes instead. Regardless, there is plenty of striking work on view, including that of Mr. Dreamworks himself, who still has eerily keen instincts for maximizing the emotional impacts of his shots. 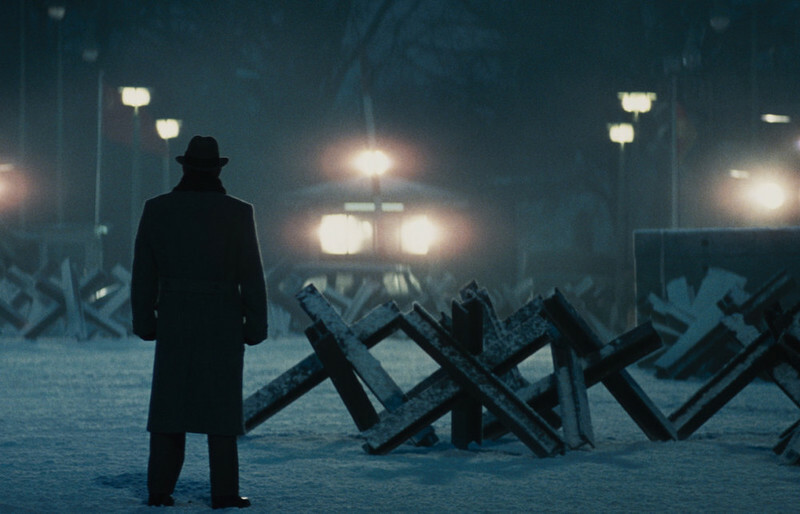 Recommended for reasonably enthusiastically for fans of Spielberg and espionage movies, Bridge of Spies screens again tonight (10/5) at Alice Tully Hall as part of the 2015 NYFF, in advance of its October 16th theatrical release.